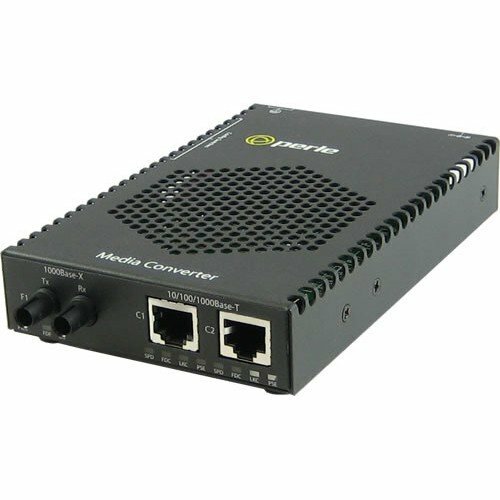 Perle's feature rich Gigabit rate converting PoE Media Converters transparently connect copper to fiber while providing Power over Ethernet ( PoE ) to standards-based PoE and PoE+ compliant devices such as IP cameras, VoIP phones and wireless access points. Perle PoE Media Converters are classified as Power Sourcing Equipment (PSE). While using standard UTP cables that carry Ethernet data, Perle PoE media converters can also provide power to one or two Powered Devices (PDs). Perle has PoE media converter models that support the IEEE 802.3af PoE standard (15.4W of power) or the IEEE 802.3at PoE+ standard (30W of power). Perle 10/100/1000 PoE Ethernet to Fiber Converters provide an economical path to extend the distance of an existing network with fiber cabling. At the same time they function as PoE injectors to power devices like IP phones, video conferencing equipment, IP cameras and Wi-Fi devices over copper UTP cabling.